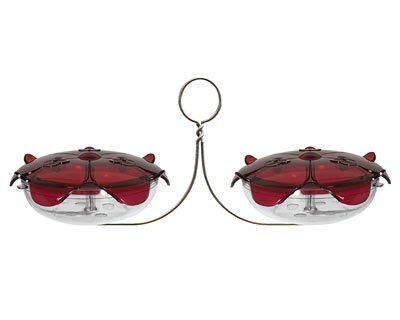 Double the hummingbird activity in your yard by placing this Droll Yankees Ruby Sipper Duo Hanging Hummingbird Feeder in it. This adorable, convenient piece houses two of the Droll Yankees Ruby Sipper Hummingbird Feeders in its hardy, stainless steel frame, creating a bevy of dining spots for the flying jewels in your area. Each vessel holds 4 ounces of nectar, and has a deep red, plastic cap for added color and style. Three ports on each cap allow a few birds to dine simultaneously, and its scalloped edge mimics a flower in bloom. Alternating, small upturned petal shapes bring even more style to the feeders, and their domed caps direct water away from the nectar. Remove these lids to clean or refill each reservoir in moments, and use the recipe engraved on the base of each vessel to make your own nectar. These dishes rest in the included, stainless steel frame, and a loop in the center here makes it easy to suspend the piece from a branch or bracket. Its plastic and steel construction ensures a lasting feeding station, while the classic color scheme helps attract hummingbirds to the area. Feed double the amount of hummingbirds in your garden with this Ruby Sipper Duo Hanging Hummingbird Feeder. Made in the USA. Lifetime warranty. Droll Yankees Happy Eight-2 Hummingbird Feeder, 32 oz.